Something about this book grabbed me from the start. I read the information via TLC Book Tours (they sent me a copy to read and review) and decided I needed to meet the main character, Andy Carter. Now, admittedly, I don't always read books where men are the main character, it's not an intentional choice - it's just the kinds of books I'm drawn to tend to be women's literature. But I not only needed to meet Andy, I needed to know more about him and understand who he was. And through Matthew Norman's story that I definitely do. He's screwed up a lot. That really is the best word to describe him. But true as the title says, we're all damaged. Andy heads home to Omaha from his new life in NYC because his grandfather is dying. He hasn't been there in ages, and is pretty happy with that, but knows it's time to go home. Andy meets Daisy - a mess of a thing - who seems to have a handle on what he's going through and what's needed. They connect, strangely enough, in a way that's comfortable for us all. We like Daisy. We're not sure what she's up to, or if she has hidden motives, but we like her anyway. Andy's parents are a bit of a mess. His mom, especially, is on an anti-gay marriage crusade as she's working towards succeeding in television news. His dad doesn't know who his mom is anymore. And his brother's a dad with messes of his own to manage. We're All Damaged is the kind of book you jump into and want more from. It's not wrapped in a tidy bow when it ends, even though there is resolution. The end leaves me open to waiting for more from Andy. Actually, I guess the end is kind of wrapped up in a bow, even though much of it feels as though it isn't. I can't explain it much better than that. I think you'll enjoy this book. The story is different. It's a great read. The characters are relatable, likeable, even when you don't like them (follow? I know, it sounds odd! ), and interesting. 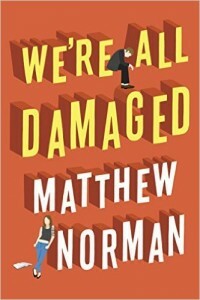 You should go buy yourself a copy of We're All Damaged on Amazon right now. If you'd like to enter to win a copy leave me a comment with your favorite male author. I think I need to introduce myself to a few and would love to hear from you who you recommend. My favorite male author would be Chris Bohjalian. His books are always very different from one to the next. Having said that, I do enjoy some more than others, but I never have to worry about his books following the same format that several authors who have lots of bestsellers do.